Songs-DB is a free MP3 player, jukebox and music organizer which takes care of large collections of MP3, WAV, Windows Media Audio (*.WMA), audio CDs and virtually any other format. It can scan, play, convert, grab, tag, rename, make playlists, search, cache, normalize, query CDDB/Freedb and much more. 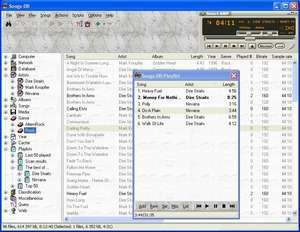 An internal player with WinAmp compatible skins and plug-ins is present, but Songs-DB can cooperate with WinAmp itself too. For security reasons, you should also check out the Songs-DB download at LO4D.com which includes virus and malware tests. Additional screenshots of this application download may be available, too. Songs-DB has a presence on social networks.